WASHINGTON — It was dubbed college football’s “Game of the Century.” On Dec. 6 1969, the Texas Longhorns overcame a 14-0 fourth-quarter deficit to stage a 15-14 comeback over the Arkansas Razorbacks, accepting a plaque from President Richard Nixon en route to a National Championship. But Texas safety Freddie Steinmark limped during the game, and two days later, visited a doctor with pain in his left thigh. A biopsy revealed a bone tumor, requiring an urgent amputation of his leg and a beginning a 17-month battle with a deadly disease that sparked a national conversation on cancer. Now, those “people who knew him” have penned a book to make sure he’s never forgotten. Bower Yousse and Thomas J. Cryan, authors of “Freddie Steinmark: Faith, Family, Football,” introduced the new movie “My All American” Monday night at National Geographic’s Grosvenor Auditorium in D.C. The event was sponsored by Representatives Ed Perlmutter, D-CO, and Lamar Smith, R-TX, and included remarks by Dr. C. Norman Coleman of the National Cancer Institute. 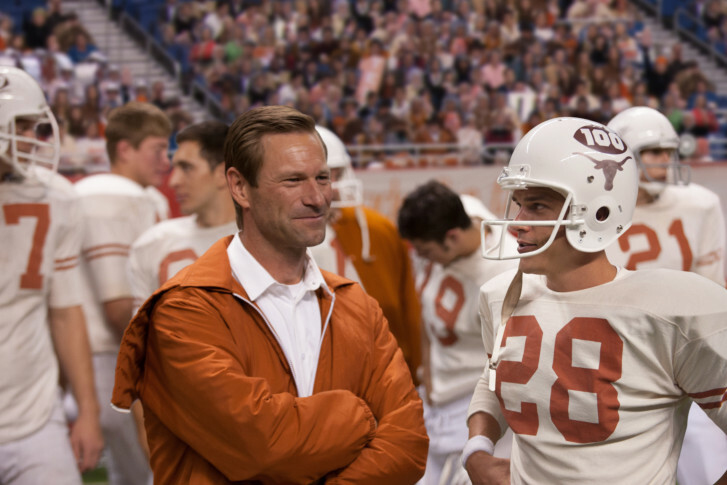 The film (in theaters now) stars Finn Wittrock (“Unbroken”) as Steinmark, Aaron Eckhart (“The Dark Knight”) as Coach Darrell Royal and Robin Tunney (“Vertical Limit”) as Steinmark’s mother Gloria. Written and directed by Angelo Pizzo, writer of such sports flicks as “Hoosiers” (1986) and “Rudy” (1993), adapted the film from a separate book by Jim Dent and has taken a few knocks for the film’s sentimental portrait. Still, the true story is one to be experienced, idolized and remembered. In fact, Yousse knew Steinmark since they were eight years old. While Yousse personally knew Steinmark, co-author Cryan met Steinmark’s younger brother, Sammy Steinmark, who was coaching football at the Air Force Academy. “(We) pooled our resources to make what we felt was a real magical story in this book,” Cryan says. While the book covers the “Game of the Century,” it also digs deeper into Steinmark’s family life, including his father’s reaction to his son’s most pivotal play, which ironically was a penalty. With the game on the line, Steinmark drew an intentional pass interference that saved a certain touchdown and allowed a Texas teammate to nab an interception two plays later in the red zone. Watching games in 1969 was a communal national experience, just months after the Moon Landing. Everyone from Bob Hope to President Nixon reached out to comfort the Steinmark family. At Steinmark’s funeral, President Nixon’s personal representative pulled Steinmark’s mother aside and asked if there was anything the White House could do to help her grieving process. “She said, ‘Yes. Tell him to fight cancer like he fights all these other wars,'” Yousse says. The same year, James Caan (“The Godfather”) and Billy Dee Williams (“Empire Strikes Back”) starred in the TV movie “Brian’s Song” (1971), a tear-jerker about Gale Sayers’ friendship with cancer-stricken teammate Brian Piccolo, who became pen pals with Steinmark before both passed away. Now, Steinmark is finally getting his cinematic due, though his legacy has long echoed off screen.